Luckily for living here, I don't have to wait until someone has a birthday or for some holiday to bake cupcakes - I don't have to because I can eat it on my bread - for my snack - or after lunch dessert. Oh yeah! 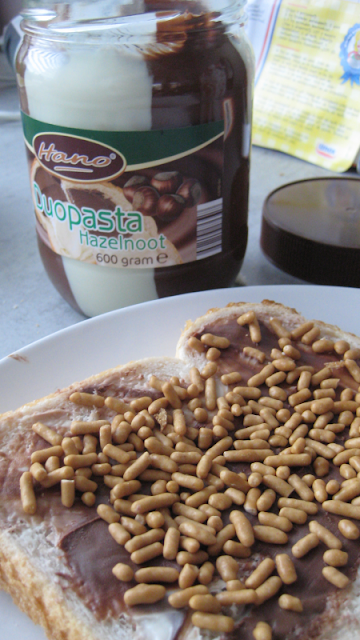 I tried it sprinkled over some light margarine and that was good - but it's much more enjoyable spread over duo pasta (what we call a "Nutella" type spread)... the benefits of living in the Netherlands. Mmmmmm good. 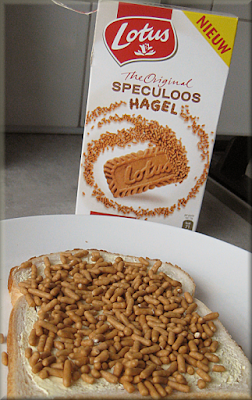 You know I think that the Speculoos Hagel is much - much better than the Speculoos spread - so you know what? If you have access to it - I highly recommend going out and getting some... like right now! And if your local grocery store doesn't carry it - tell them you want it - and then pre-order two cases just for your food storage and why not throw a couple boxes into your 72-hour kit, too... don't have a 72-hour kit? Now you have a good reason to start one! It's that good... it's blog worthy baby! I have come across a recipe in the Allerhande AH magazine and it looks good to me. Apparently, Belgians call their mashed potatoes with vegetables: stoemp (Dutch call it stammpot) - and I'm going to try some - using none other than Brussels sprouts and spitskool. <--- What is that? Spitskool. It's like cabbage - white cabbage - that is pointy and cone-head shaped. It's coney! I think it's cute, actually. So, this recipe calls for one spitskool. 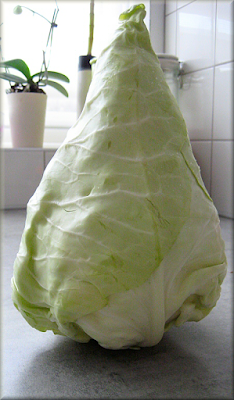 It tastes exactly the same as regular white cabbage, in my opinion, so if you don't or cannot find it, you can probably just use the regular stuff - or if you come across this at a farmers' market - now you have a recipe to make with it... so bookmark this one! One spitskool sliced and chopped up into pieces filled an entire soup pan for me. I decided to use half of it only... but as I was frying it up - it shrunk up a lot... so you can use the whole thing if you want. On a side note, isn't cabbage very common in China? Like in eggrolls and stuff? You know, this is kind of like my way of celebrating Chinese New Year without even knowing it. Okay... (note to self: I'll try and make some Chinese food tomorrow night or some kind of stir fry at least). This recipe calls for karbonades - and according to the recipe photo - that is pork chops I believe. I used Valess vegetarian schnitzel for mine because we try to follow the Word of Wisdom - eat meat sparingly. It was very tasty. You know, I'm starting to really like stamppot more than ever before. Punk Papa says he doesn't want to eat it every night - but I wouldn't mind if we did - during winter at least. It's so filling and a good way to eat my veggies. 2. Heat about 50 grams of the butter/margarine in a big pan/wok and cook the Brussels sprouts and cabbage for 10 minutes on low heat/low flame. Drain the potatoes over a bowl. With a potato masher, mash together the potatoes, 150 ml of the drained cooking liquid and the cabbage mixture all together. Adjust to taste with salt and pepper (I left it as is - with the margarine - it was salty enough for me - and I don't really like pepper in my stamppot). 3. Sprinkle the pork chops with salt and pepper, if using meat. Heat the rest of the butter or margarine in a frying pan and cook the meat 2 minutes each side until just brown. Take out of the pan and keep warm in aluminum foil. If using veggie meat replacer, cook as usual and just put aside on plate during this next step. Now, pour the pickled mini onions (zilveruitjes) with liquid into the pan, together with the brown sugar and ketcup in a pan. Cook on high flame about 5 minutes. Return the meat or veggie replacer to the sauce and cook another 2 minutes on low flame. Serve the meat together with the stoemp and the extra sauce on top. I have a box of Speculoos Hagel too! I'm from Belgium but sometimes I go to Albert Heijn for grocery shopping. Can you believe first found the hagel in The Netherlands? No, you can't buy it in Belgium. Not yet. Did you know they also have Speculoos Hagelmix with chocolate? 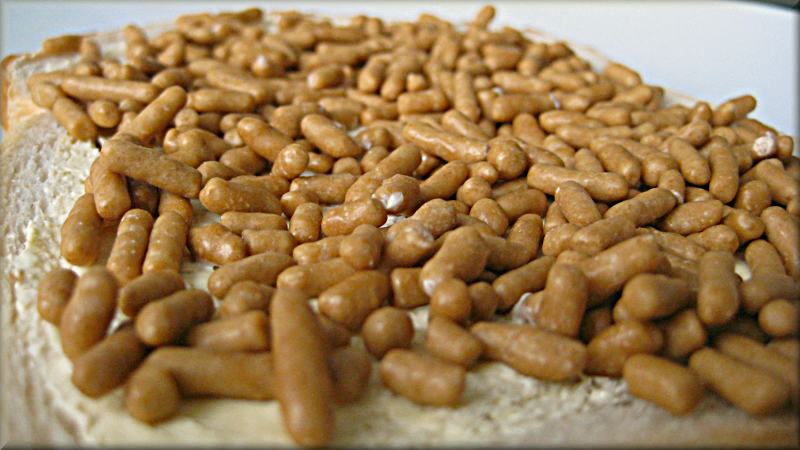 The day I bought Speculoos hagel, i posted it as my update on facebook and then like 10 of my friends where like, where did you buy those... and then a day later, they all reported that they saw them with chocolate as well. But we've had chocolate sprinkles for like ever so that's not really so special as speculoos by itself... although, i'll probably try the chocolate/speculoos hagel one day. That's really surprising that they don't sell them there. Guess it time for you to email the company to stock 'em down there. That does look delicious. And that spitskool, its kool!